LeafVac is now completely redesigned and injection molded with UV protected materials to withstand the most severe climates and stresses. New “space age” material allows for extra strength, durability and convenience. Designed to allow for fast, efficient suction-side installation at the equipment pad. With the LeafVac being installed at the equipment pad, eliminates the hassle and the costs of installing the debris canister in the deck, where all of the others are located. Ease of maintenance by simply going to the equipment area to access the LeafVac. The fully molded debris basket is designed for strength, high capacity, high flow and easy access for removal of debris. 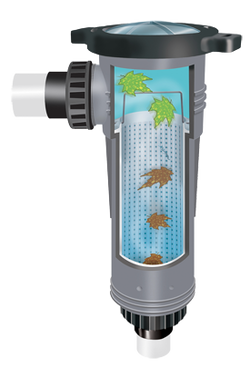 The high capacity of the basket and the high flow of the LeafVac will keep the debris from entering your pump, continuing to deliver a high flow of water to your pump will keep it from cavitating as with other systems and increase the life of your filtration pump. This in turns SAVES YOU MONEY! The newly designed clear lid will not tighten over time. This specially designed clear lid gives you the ability of just looking into the canister to see when it needs to be emptied. Plus it remains easy to open for convenient debris removal.